The fabulous Scarborough Ukes lead the carols with special guest Gerry Selkirk. A merry crowd joins in the carols on the gazebo of the the Guild Inn Estate, December 2017. 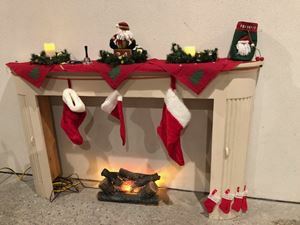 Stockings hung by the fire waiting for Santa's return to Guild Park December 2017. 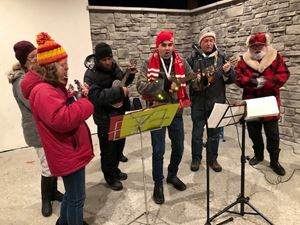 Musical entertainment at the Holiday Tree lighting 2017. Jolly Old St. Nick arrives with Candy Canes, December 2017. Our youngest Friends dance at the Holiday Tree Lighting, December 2017. Santa Claus paid a visit to the Guild Park. Children had a chance to talk with him and put in an early request for Christmas. Thumbs up for the Holidays! Christmas Tree lighting 2015. Guests gathering to enjoy a cup of hot chocolate or warm cider, December 2015. Singing Frosty the Snowman. Thumpty Thump Thump! Christmas Tree Lighting at the Guild Park 2015. Kate Kennedy, Margaret Kennedy, Lucas and George Browne join Janet Heise who read The Night Before Christmas at the 2015 Tree Lighting Ceremony at Guild Park. Jay Moonah leads everyone is rousing renditions of Christmas favorites - Rudolph, Jingle Bells, Slient Night and Frosty the Snowman.